KraftyKat: Sewist's Secret Santa - The Plan! Sewist's Secret Santa - The Plan! 1) Send me an email to kraftykatblog(at)gmail(dot)com by Friday 23rd November at the very latest with the following information - your name, a link to your blog (if you have one), your postal address and also whether you are happy to post internationally. Also, if you would like to provide a short snippet of information for me to send on to your Santa please do - for example, "I'm a sewist and a knitter, I love spots and lace and big prints". 2) I will play Santa and pick everyone's Secret Santa out of a (probably metaphorical) hat. I decided it was easiest to do it this way, and it allows me to split between people happy to post internationally and those who would prefer not to. This will not be a straightforward pairwise swap, otherwise everyone will know who their Santa is, and that just defeats the object! 3) I will send everyone an email telling them who they will be buying for, along with their address/blog link/information. 4) Present buying! This bit is completely up to you, however please try and keep within the £5 limit (or equivalent internationally). 5) Pop your gift in the post. 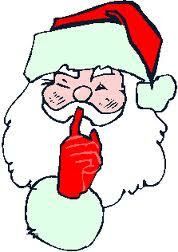 Don't forget this is supposed to be a Secret Santa, so it's most fun if you don't let on who the present is from. Please keep an eye on the last dates for posting before Christmas...check here for last Royal Mail posting dates. 6) Receive your present and pop it under the tree, or open immediately if you must, however please wait until after Christmas to share on your blog. And feel free to speculate about who your Santa might be....!! Overlockers: How do you use yours?